Please call owner Erik at 206-925-3806. 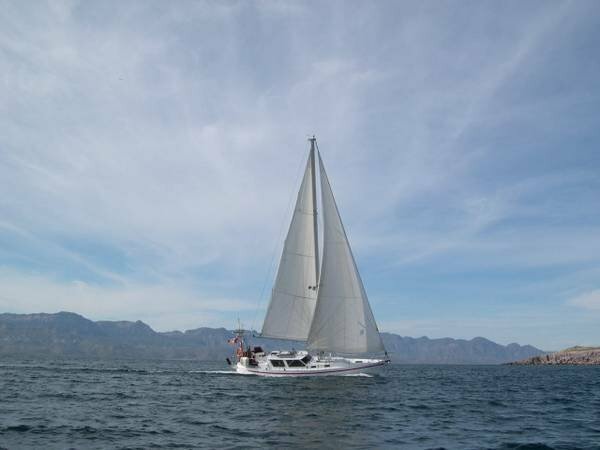 The Sailing Vessel Kattegat is a Cresent 40 sloop with a cutter rig. The hull and deck was built by DeKleer Bros shipyard and launched April 20, 1992 in Richmond, British Columbia, Canada and weighed in at 17 tons (34000 pounds) with 11000 lbs of lead internally in the keel. Shes 40 overall and 13 wide with a draft of 6 1. 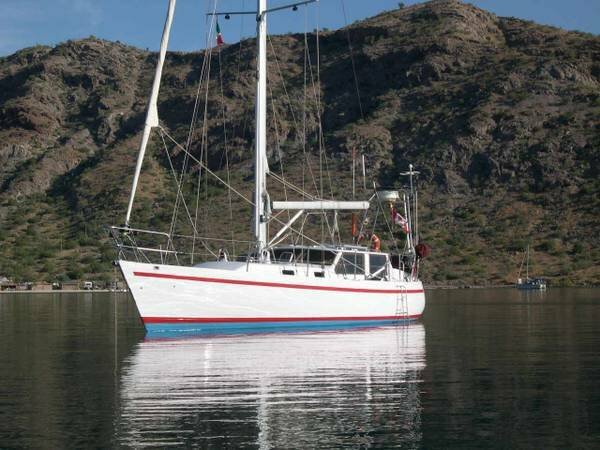 She has all aluminum spars with the mast standing 57 on deck and carries 1000 square feet of sails evenly divided between the Mainsail and the Genoa. Both sails are of the Spectra material (North Sails) and new in October 2012, there is also a Storm Jib in the sail inventory. 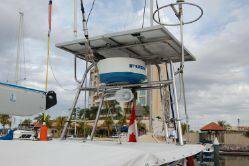 The mast has two Andersen 45 stainless steel self-tailing winches and a whisker pole attached on a track in front of the mast for easy use. 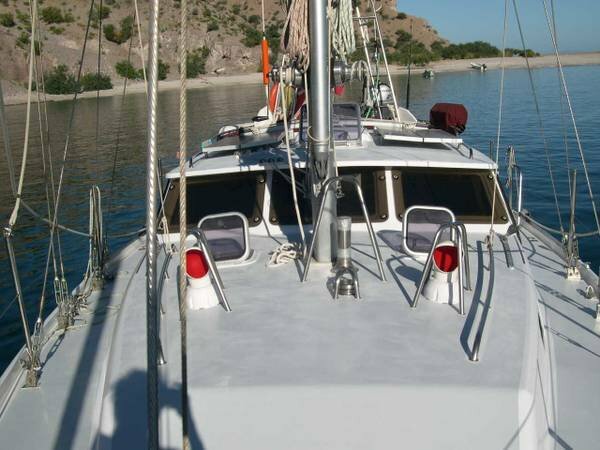 She is also equipped with a Sea Lion anchor windlass including one 50 lbs solid stainless steel modified custom made Bruce anchor with 300 of 3/8 stainless steel chain, attached to a 7/8 rode. Theres one additional 45 lb Plow anchor and a 10 lb stainless steel Bruce anchor with chain, used as a stern anchor. 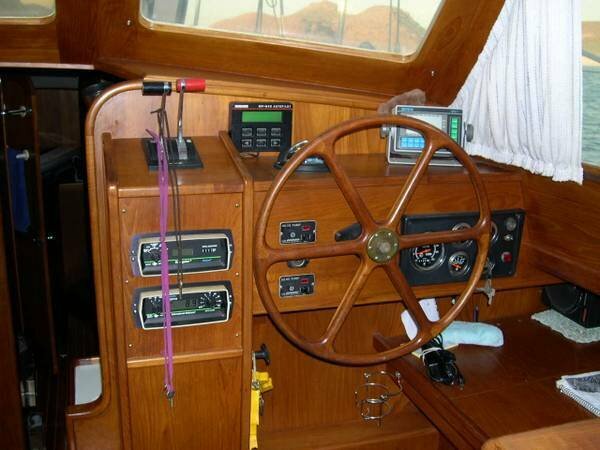 The cockpit has three 45 and two 56 Andersens stainless steel self-tailing winches as well as hydraulic steering with an emergency tiller, which also may be used as direct steering when using the Monitor Wind Vane, also new in 2010. There is a total of 4 Solar Panels, 2 on top of the pilothouse and two on top of the radar arc. The interior is all solid Teak with no veneer anywhere. She has an inside steering station with separate hydraulic systems, (all new in October 2011) and there is pressurized hot and cold water throughout the interior, including a shower and a sit tub in the head as well as a shower in the cockpit. 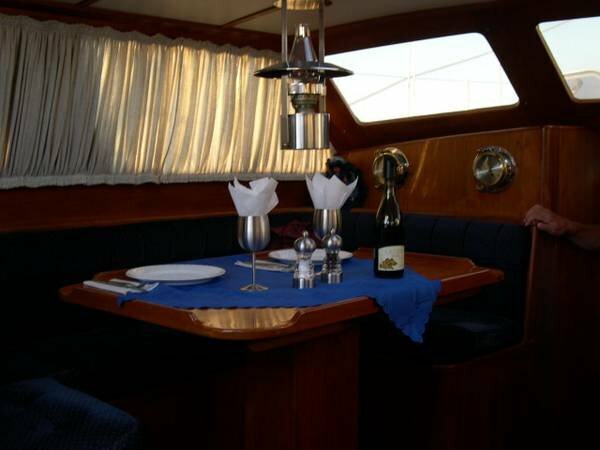 The galley is equipped with Hot and Cold pressurized water and two large sinks. One Microwave Oven. One Force 10, 3-burner stove with oven and broiler (new in 2010). One 5 cubic feet Deep Freezer and a 5 cubic ft Refrigerator. The instruments consist of One Raymarine ST 6002 Smart Pilot, Autopilot. 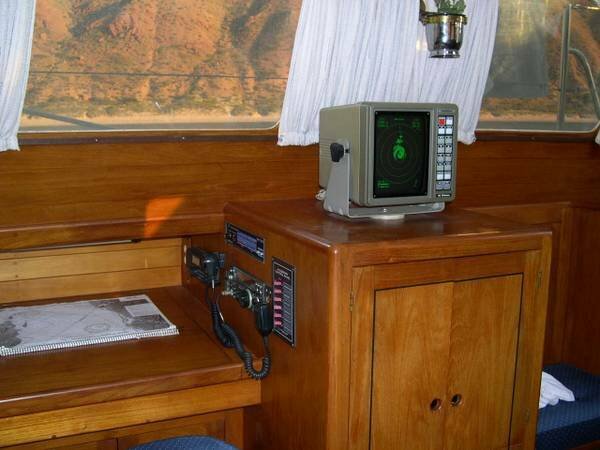 One Raymarine ST 40 Dept Sounder. One Icom IC- M422 VHF Transiver. One Icom IC-718 SSB, HF and Ham Transceiver, One Furuno Model 1832, 36 mile Radar. One Furuno Model GP-32 WAAS GPS One Xantrex 20 Inverter. All the above mentioned instruments were replaced and new in 2009. 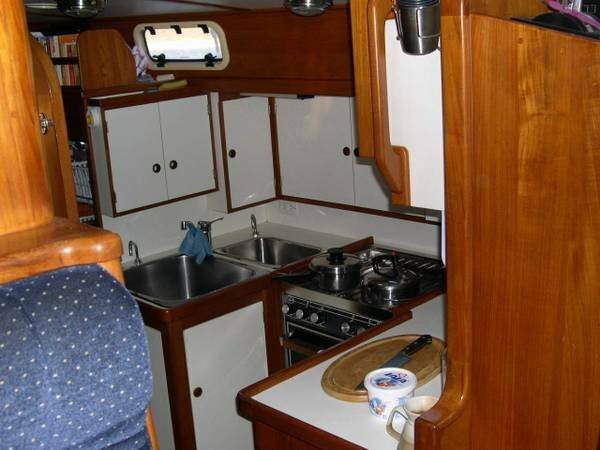 There is also a Spectra 14 GPH Cape Horn Water Maker new in October 2011. The refrigeration system is two Frigoboat Compressors, one to operate the Freezer the other the Refrigerator, both new in November 2011 and are operated through a Keel Cooling system. The running rigging was replaced in 2012 and the standing rigging was replaced in 2013. 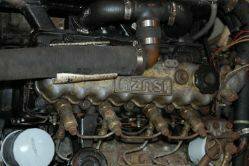 The main engine is a 65 hp Isuzu C-240 Diesel, driving a fixed three bladed Campbell propeller, with a total of 4200 hours. The auxiliary engine is a 15 hp Isuzu 2 KC1 Diesel, operating the Diving Compressor and a 150 Amp Alternator with only 1800 hours. 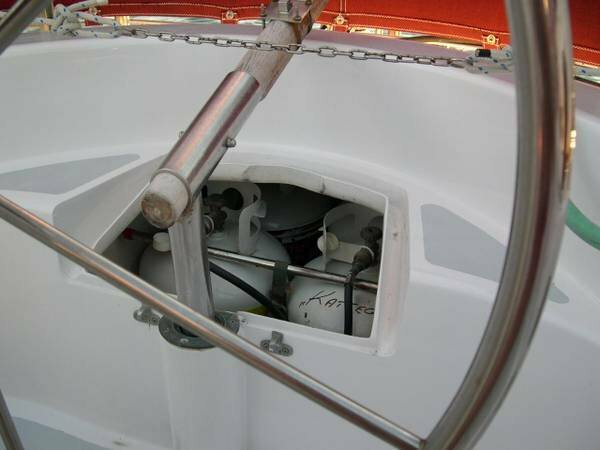 The dinghy is a 8 ½ Achilles with a 9.9 hp Honda both new in 2007 and a new cruising Bimini was installed in March 2011 as well. While in dry storage at Opequimar Marine, Puerto Vallarta over the summer of 2010, the entire vessel was painted with All-Grib two part epoxy paint (Snow White). Theres a large spare parts list as well, which includes Bilge pumps, Water pumps, Head pumps, Offshore repair kit for the Water Maker and Monitor Wind Vane, all needed filters etc, too numerous to mention. 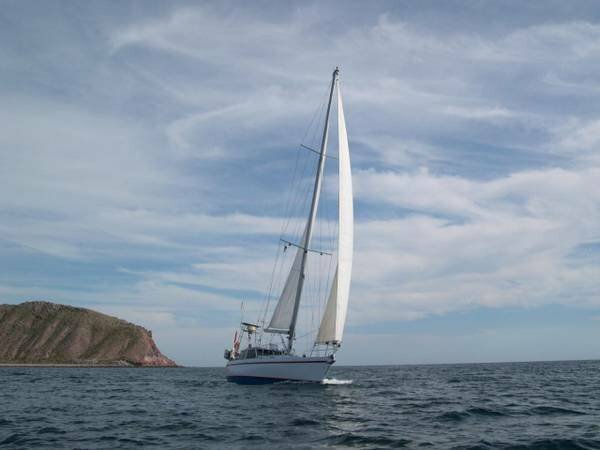 This vessel is positively beautiful and has been lovingly maintained throughout her life with no cost spared at any time. All oils have been changed every 100 hours or every 6 months, which ever comes first. 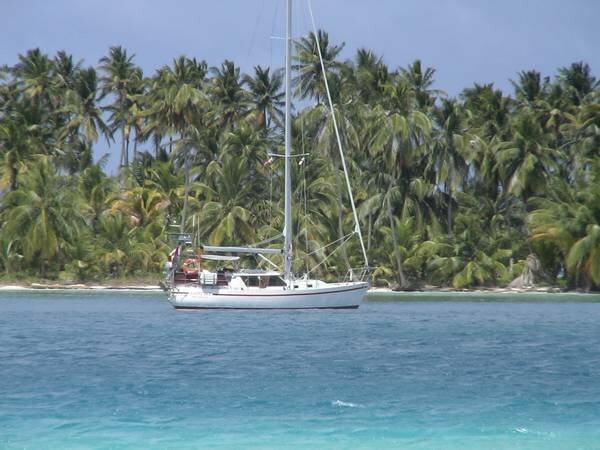 This beautiful vessel is a 100% turn key operation and is listed for only $160 000 US. She is dry stored over the summer in Marina Guaymas, but will return to Mazatlan and Puerto Vallarta in October 2017.